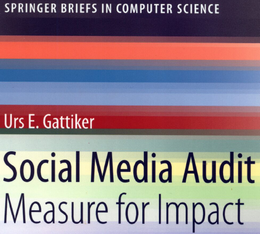 Our focus includes BP’s online advertising costs, UBS’s failure to understand consumer perceptions, Facebook invading our privacy AGAIN, and other heavyweight brands’ trials and tribulations. What do you think of a bank whose CEO is in a YouTube video… Great, right? UBS’ new advertising campaign, Wir werden nicht ruhen (we won’t rest), is supposed to get the bank back to its roots of Swissness (values, quality). We presented this to a target audience of 10 current, Swiss UBS customers (not a representative sample but interesting, nonetheless). Result: Not one found the video informative or real and seven of the 10 subjects pointed out the race and gender issue – it seems all of the managers are young, male Caucasians, so is it an equal opportunity employer on paper only? Question: Why did UBS not survey its customers before spending all this money on advertising that accomplish little, if not backfire? But Oswald Grübel is not the only one to underestimate social media and how it spreads news. For instance, Putin delivered his latest macho stunt, a 2,000 km drive across Siberia in a canary-yellow Lada Kalina that he called ‘comfortable’ and ‘reliable’. Another example of how a PR stunt can turn into a nightmare if bad news goes online, or worse, viral. 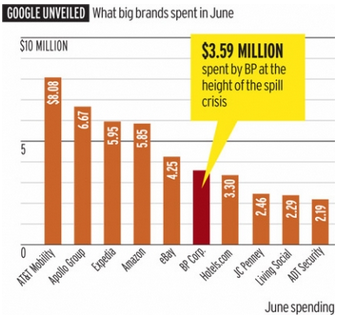 The chart to the right shows how much some companies paid Google in the US in June 2010 for paid search advertising. Whenever companies have a major product launch or need clicks to achieve higher sales, paid Internet advertising can help. In the case of BP, the firm felt a PR blitz was required to defend its reputation. In July we reported that the US Securities and Exchange Commission (SEC) had struck a ‘deal’ with Goldman Sachs, whereby the latter agreed to pay US$550 million to settle civil fraud charges of misleading investors. 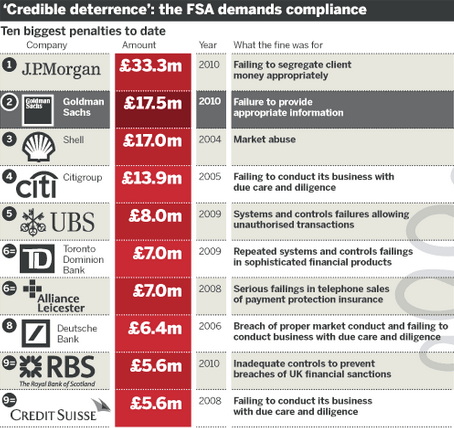 Now Goldman will swallow a £17.5 million fine to settle a five-month investigation by the UK Financial Services Authority (FSA). Considering how much companies like UBS, Goldman and BP spend on television and internet advertising, these numbers seem paltry. For instance, Goldman Sachs’ US settlement is only worth about 10.2 trading days of earnings. – launching PR campaigns that quickly help rehabilitate the company’s image. If you are a Facebook user, you need to make two changes on Facebook Places (geo-taging), because whether you want to use or enjoy this type of service is irrelevant. 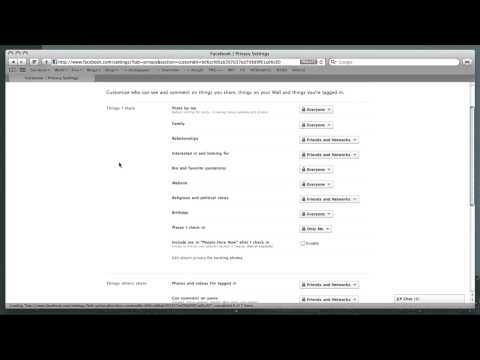 – Facebook geo-tag is turned on by default, AND other users can ‘tag’ you without your permission (read how to change this in three easy steps). This strikes me as an awfully bad idea and a definite violation of my privacy. So how can you turn this off? Glad you asked; below is a video that explains it all. 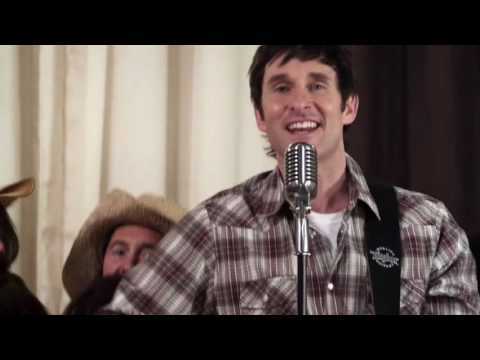 And to finish off the week, I thought I would show the last of a three-part video series by Nova Scotia musician Dave Carroll, who became famous with his song, United breaks guitars. P.S. 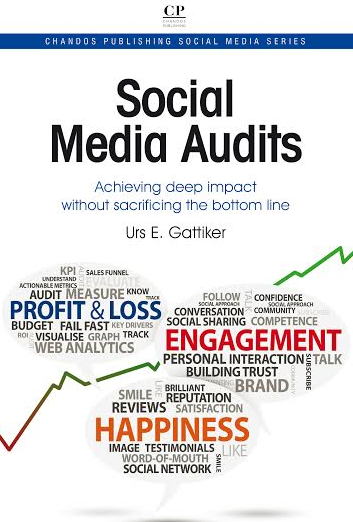 – The answer to the title of this blog post: Underestimating the power of social media can be costly, but with deep enough pockets, PR can fix anything. Article source: ComMetrics weekly review: What do BP, big banks and Putin share?